The FREE Network is guided by core values. True to our commitment, FREE is steadfast in our belief that the interests of the people we support must be the guiding principle in all that we do. Our mission, vision, values and strategic direction reflect this belief. The strategic themes outlined in our plan distill FREE’s strategic direction into key themes that will serve as a powerful management tool that aligns our priorities, behaviors and decision making at all levels of the organization. Strategic themes are the building blocks around which execution of strategy occur. These themes allow us to be proactive in influencing the future of the FREE Network, which is particularly true in these unprecedented times of continuous change. 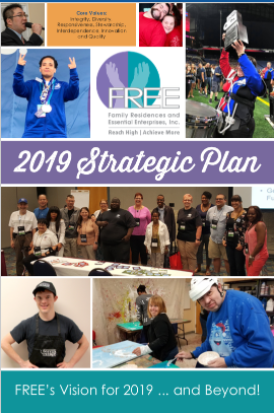 The success of our strategic plan will require a commitment from the entire FREE family and we are confident that because of the unrelenting dedication of our valued stakeholders, that we will have an exceptional year.